Microsoft and SparkFun have teamed up to bring you some IoT (Internet of Things) fun. The Microsoft Azure IoT Starter Kit for the SparkFun Thing Development Board has been designed to help you seamlessly connect your device to the cloud with Microsoft Azure IoT. 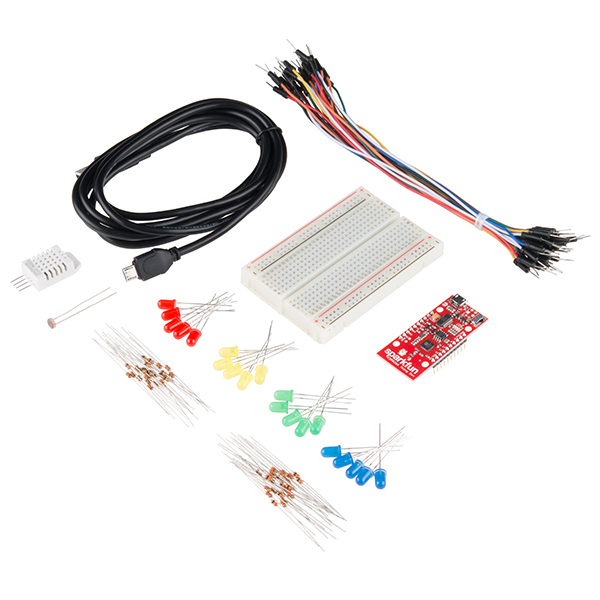 This kit includes an Azure certified for IoT SparkFun Thing Dev Board, and a breadboard and wires to help you set up your circuits. There are also a variety of sensors such as a photoresistor to sense light as well as a humidity/temperature sensor to read the ambient temperature and humidity in a room (or outdoors with some weatherproofing). Once your board is connected to Microsoft Azure you can start visualizing and analyzing your data. Microsoft Azure is a leading provider of cloud computing and Microsoft Azure IoT Hub enables secure, reliable bi-directional communications between IoT endpoints such as sensors and the cloud. Azure IoT Hub supports a broad set of operating systems (Linux, Windows, RTOS etc. ), protocols and common languages, so you can configure your connections to the devices. The SparkFun Thing Dev Board is based on the popular ESP8266 WiFi module. With it you have a simple microcontroller with built in WiFi to interface with your sensors, buttons, and LEDs that can be controlled from or post data to the web. Everything you need to get started from voltage regulation to a PCB antenna are built into the board. Just plug a USB cable into the board and you can actually start programming in the Arduino IDE or other environments. Note: Microsoft Azure account sign up requires a credit card. Microsoft does state that this information is collected only to verify your identity and that you will not be charged unless you explicitly upgrade to a paid offer.